The inspiration for this Christmas Extract recipe was a home made Vanilla Extract recipe that I saw on Pinterest. When I realised how easy that was to make at home it got me thinking, and this is what we came up with. We started making our extract at the end of August, so that we could give our concoction time to develop it’s flavours, and ensure that it would work – and it does! 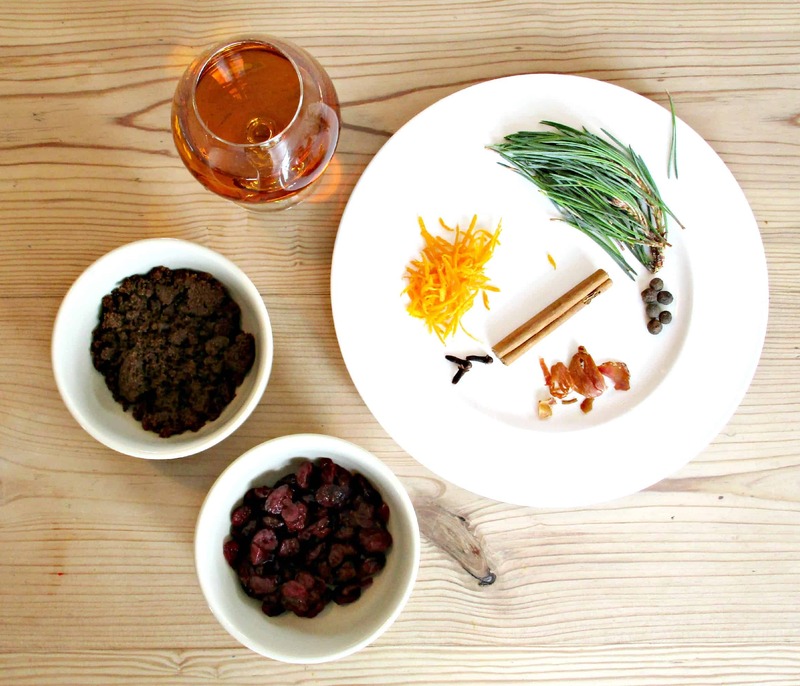 This is our own original recipe, our aim was to produce an extract that has all the aromas and flavours of Christmas concentrated into it – add a teaspoon to cakes when baking, mince pies, cocktails, desserts or anything else you can think of. 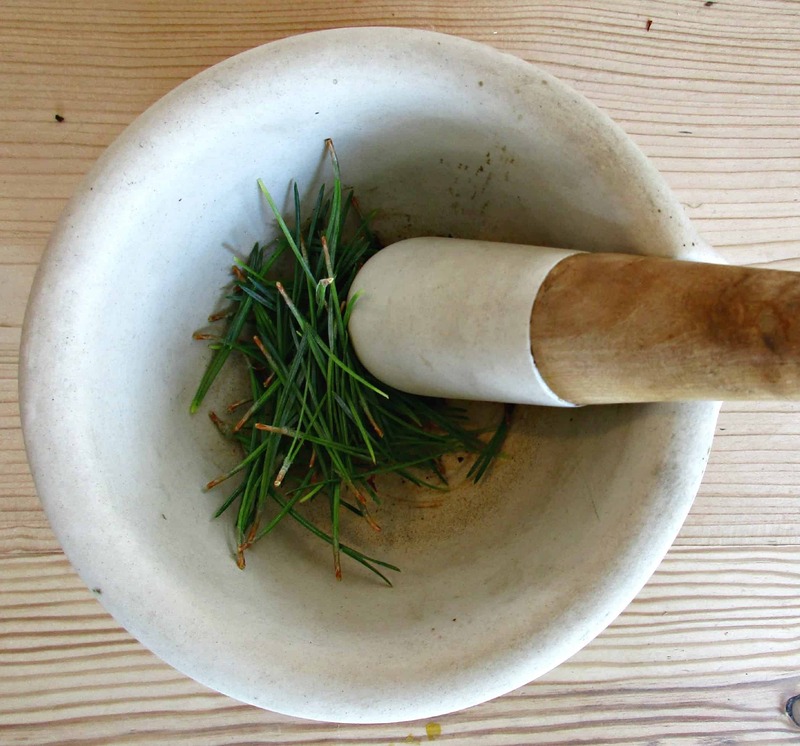 Not everyone is aware that pine needles are edible, and are in fact high in vitamin C, as well as having other benefits. When foraging please ensure you are 100% sure of what you are picking, and bear in mind that some evergreens such as yew are highly toxic. I also recommend that you provide an ingredient list with any home-made items that you give away as gifts, so the recipient can make an informed choice to whether or not it is suitable for them. Bruise the spices and pine needles in a pestle and mortar, and add to a jar with the molasses, cranberries, orange zest and brandy. Pop on the lid, and give it a good shake. Leave in a dark place to infuse for at least 4 weeks, giving it the odd shake when you think about it. We tasted it every so often to check how it was developing, and although we didn’t feel a need to adjust it, you could easily do so. 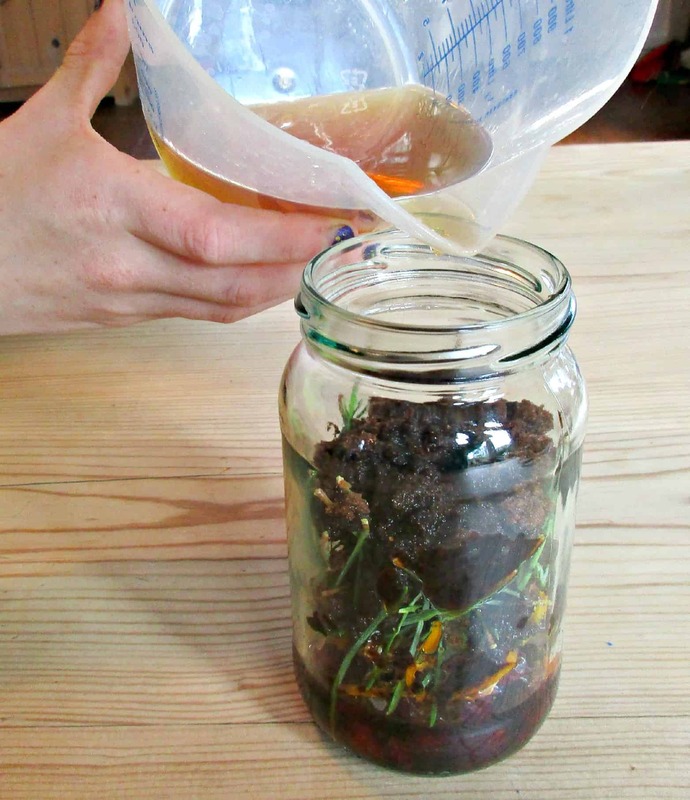 Once you are happy with the taste of your extract, strain through muslin and bottle. The flavour of your extract will continue to mature and mellow over time. Our Christmas extract is dark and syrupy, and smells like Christmas trees and mince pies, which is exactly what we hoped for. 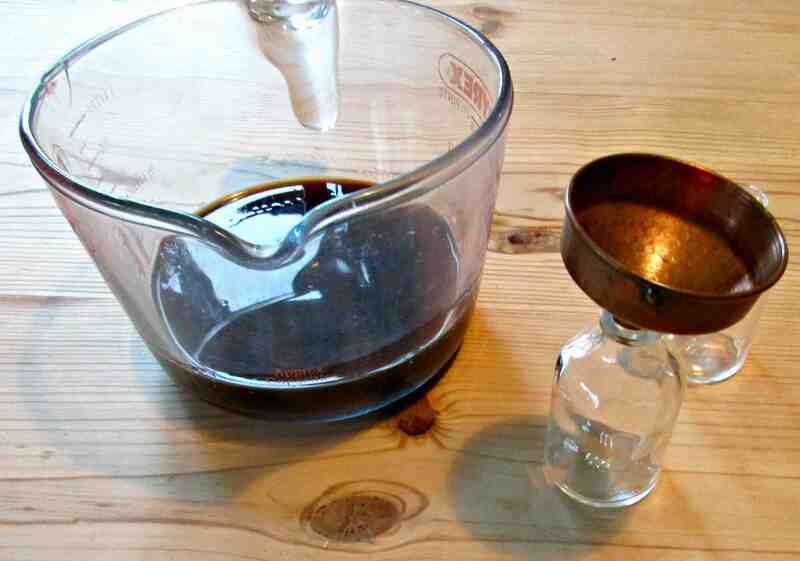 It is very concentrated, and we plan to use it in exactly the same way you would any other extract. When we made it we also made a liqueur version, with exactly the same ingredients but with the added addition of Vodka – here is the recipe for our Christmas Spirit. Lovely and thoughtful gift idea! I’m a little concerned about the little bottles with corks being enough to keep the extract safe from spoiling. What are your thoughts, please? I see me using this in coffee, with a generous spray of whipped cream on top! Yum! Thank you! Thanks for you kind comment Samantha. I’ve never had any problems with it spoiling but you could use a screw top lid instead. The coffee sounds delicious! The house must smell amazing. I have tried this with half of your ingredients and it was nice but with the rest, it will be even better. I am going to use this for infusion. I am fighting dust all winter so I pace swifter sheets on all my heat registers. This recipe will be amazing to make and put on those sheets. Pinning and now I got something else on my must do this week list. Thanks for sharing. Oh my soul, this must be amazing Sarah. I never knew about pine needles but it makes sense some how. The combination of vanilla and that beautiful fresh, green pine smell must infuse everything. I can’t wait to try make some. I’d never have thought of making something like this but I bet it smells amazing! I love this idea, it’s new to me so I know own my family will be impressed! So, about those pine needles, I’ve never heard of this. I think I’m going to make this and try some different recipes. Thanks for this unique idea. We were so pleased with how it turned out – and it’s even better this year now it’s matured – it smells amazing! Fantastic idea! I really like the sound of this. It’s got a lovely flavour – we’re putting it in everything, even used it to marinade some meat on the weekend! This sounds amazing, great idea to make cakes and desserts a little more special. I love that you used pine needles too, that’s definitely one of my favourite Christmas smells! Would be perfect for adding to something like shop bought mincemeat to make it a bit more special. We had lots of fun going around an arboretum trying out all their different pine needles – people must have thought we were mad! I had absolutely no idea that pine needles were edible although they are not something I fancy trying! I can just imagine how glorious your extract smells, Christmas has it’s own magical scent doesn’t it? It really does 🙂 . 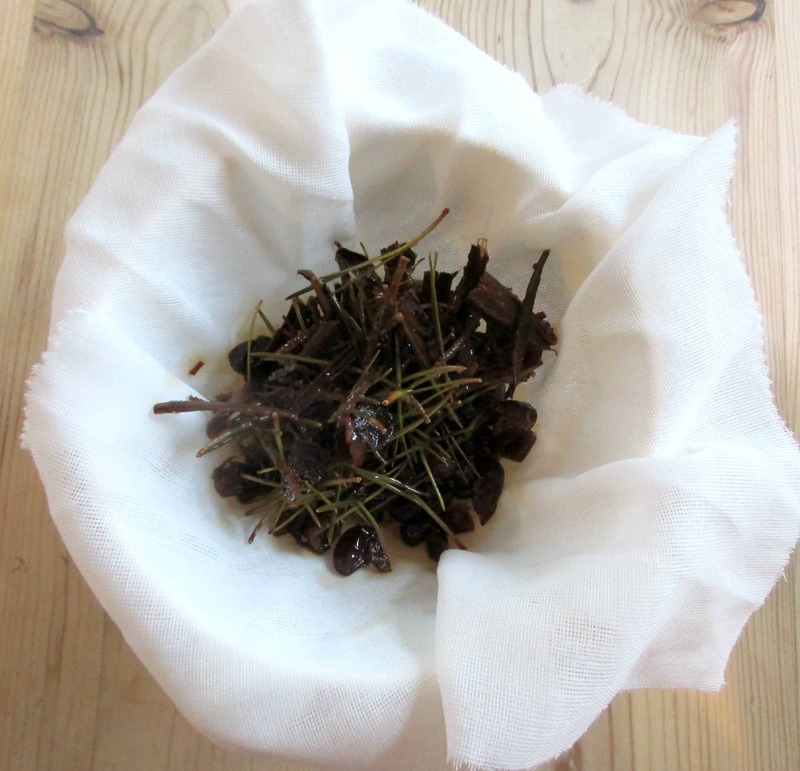 We did chew on a couple of pine needles to see what they were like before we made the extract, and they tasted how you would imagine really – apparently they are loaded with Vitamin C! We make hampers for our family every year, so that’s whats its meant to be for, although we keep sampling the liqueur version so I’ve had to put another batch on! Oh I just love the idea of a Christmas extract – I’d use it all year round to cheer myself as I’m always happy at Christmas 🙂 Actually perhaps I should switch to the Christmas spirit, that definitely sounds like it would perk me up! Such a great idea, it’s made me smile just thinking about it. It’s amazing how a smell transports you straight to a place isn’t it? The spirit is super yummy, I’m making more as I’ve half drunk everyone’s Christmas pressies already! What a fantastic idea! I wish I could scratch and sniff the computer screen, I bet essence of Christmas smells absolutely amazing! It’s a lovely way to add a little something to a dish. We have a liqueur version too for when you want the Christmas taste without the effort of cooking first! This is lovely! How creative. I’ve always wanted to make vanilla extract, but I haven’t yet, I’ll have to add this to the list as well! Brilliant! Intriguing! 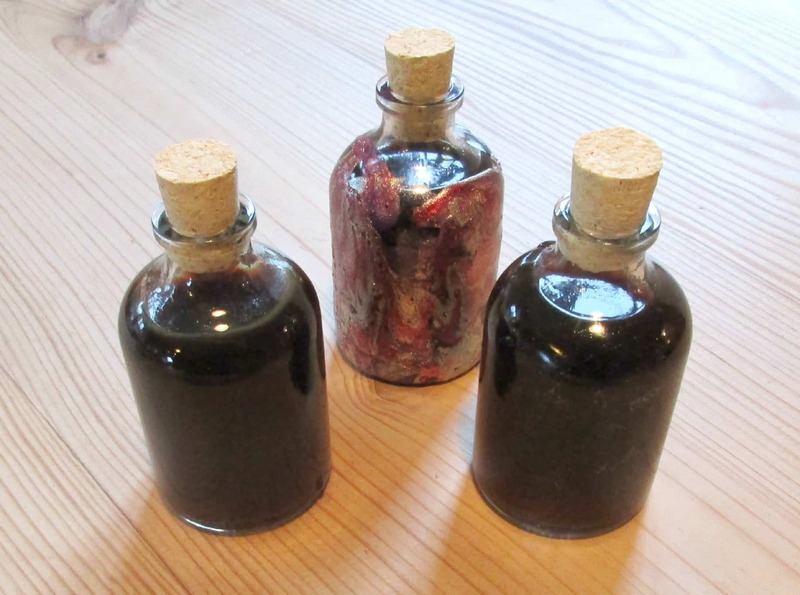 I’ve made my own vanilla extract for years, but think I may need up my game a bit. You gave some ideas on how to use it and I’d love to know what specifically you have used it in.